This guide explains how to install DotNetNuke to your domain's hosting via hostControl. Log into your account via hostControl - https://secure.hostcontrol.com.au/. Once logged in, select the "DotNetNuke" menu item under the Applications section. If wanting to install to the root of your website, select your domain from the dropdown menu and leave the field next to it blank. Once you have chosen the version and installation path you can click "Install Application". Once it has finished installing the files, there will be a notice in hostControl confirming it has been successful. To complete the installation, browse to your domain's URL in your web browser. On the first step of the installation, fill in your Administrative and Website information details. You will need to create a username, password, email address and website name. Stay on this page and move to step 4. Down the bottom of the same page you will see a section called Database Information. DotNetNuke requires an SQL Server database to connect to. 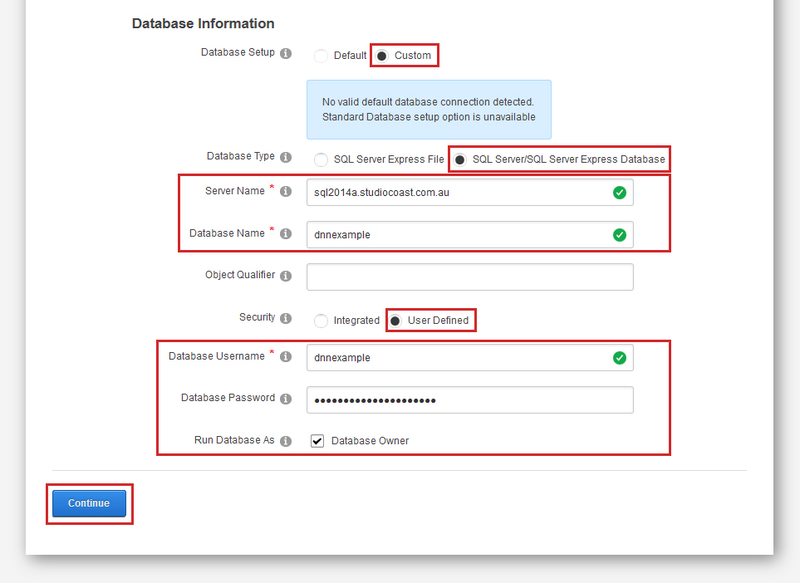 You will need to create a new blank SQL Server database via the "Databases" section of hostControl for this to connect to. (Please see our guide Here on how to create a database if you're not sure). You will need to enter the following into the Database Information section. Once filled in, select Continue. Server Name: The name of the server that your database is located on. This is called "Server" in the Databases section of hostControl. Database Name: The Database Name which is also the same as the username. This is called "Name" in the Databases section of hostControl. Database Username: The Database Username. This is called "Username" in the Databases section of hostControl. Database Password: Your database's password. Run Database As: Database Owner (ticked). IMPORTANT: Make sure you check your database's connection details via the "Databases" section of hostControl. The below is an example only. If you have entered all the details correctly you should be presented with the screen below while it is being installed. If you see any errors, skip to step 5. 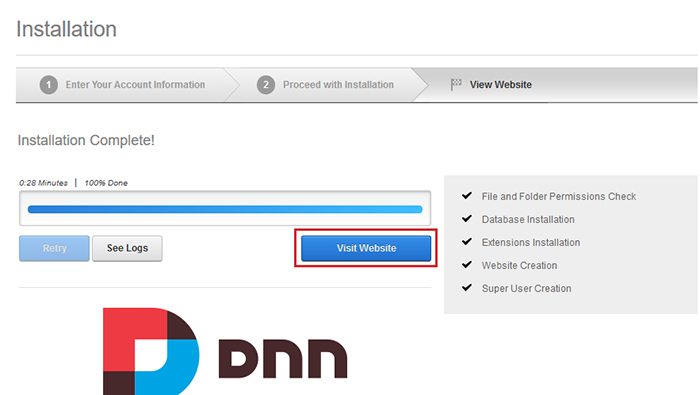 Once the installation is complete, select the "Visit Website" button and you can start using DotNetNuke. If you do, this means you need to set your website to use Full Trust by adding a tag into your website's web.config file. Keep the DotNetNuke installation page, open and make the changes to the web.config file located in the root of your domain. If you are unsure of how to do, contact Support and we can assist in enabling this for you. Once you have added the tag, select the "Retry" button and it should complete the installation. (You may need to select Retry twice).